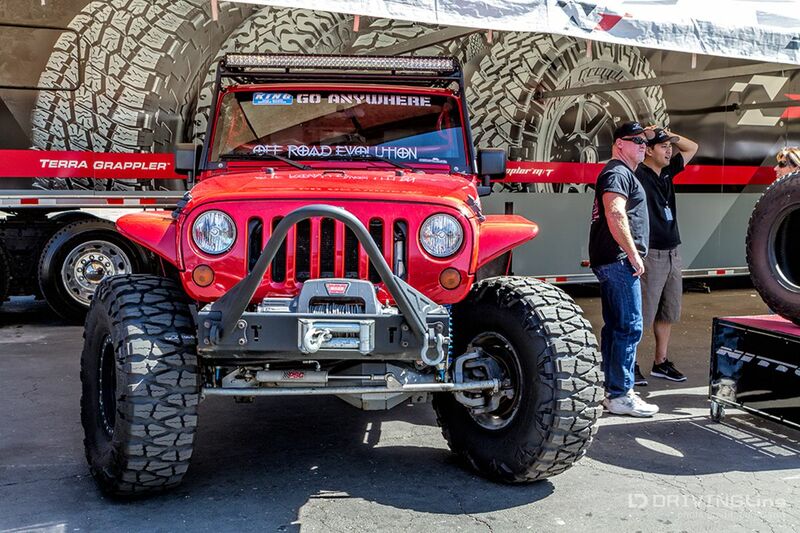 If you're looking for what's hot in the off-road community, the 2013 Lucas Oil Offroad Expo, is the place to go. Undoubtedly one of the largest shows in the country, it features everything offroad with over 300 vendors of vehicles, parts and accessories. With a crowd of more than 65,000 off-road enthusiasts, the unusually warm October temperature wasn't the only thing that was hot! As I visited the vendor booths asking “What’s hot this year?” I got the same answer over and over; “Anything JK”. The evidence was on the show grounds; it was wall to wall Jeep Wrangler JKs, especially four doors. You’d be hard pressed to find any of the other popular off-roading vehicles because they were few and far between! The Jeep Wrangler JK, available in 2DR and 4DR Unlimited models first debuted in 2007 as a replacement for the TJ model. Vehicle sales haven't slowed down for Jeep, the JK set an all-time sales record in 2012 and is on track to break that record in 2013. The 4DR model has helped the Jeep Wrangler break out of its niche and appeal to a wider mainstream market. 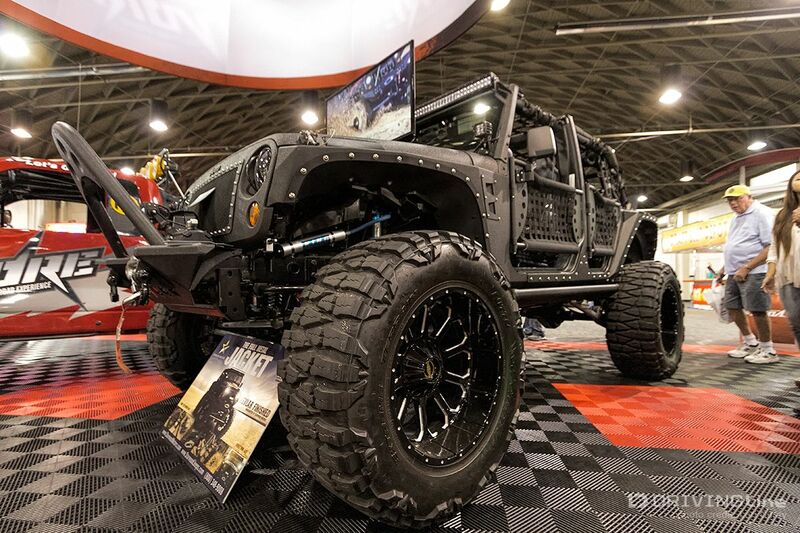 It seems everyone is using JK Wranglers to showcase their products on and the JK platform has proven to be well-adaptable to specialty project builds. How about the Kevlar coating featured here? 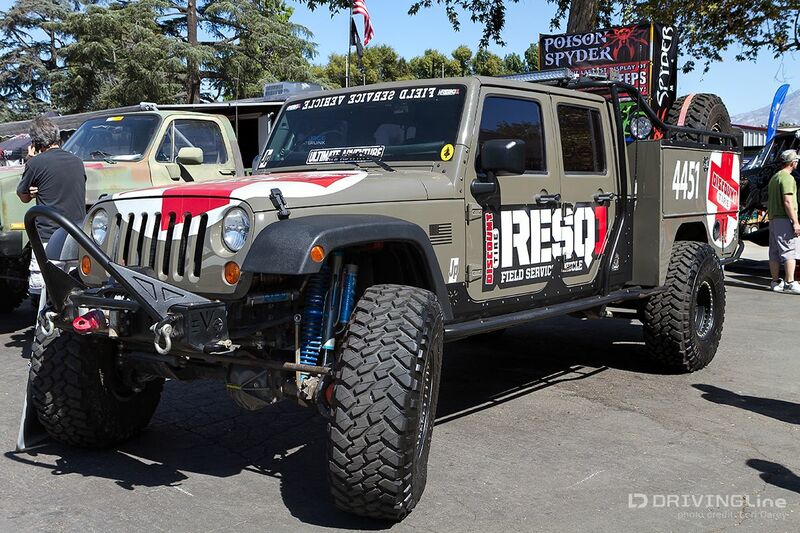 Discount Tire built their RESQ1 Field Service Vehicle on a stock JK 4DR body, done by Mel Wade and the crew at Offroad Evolution. 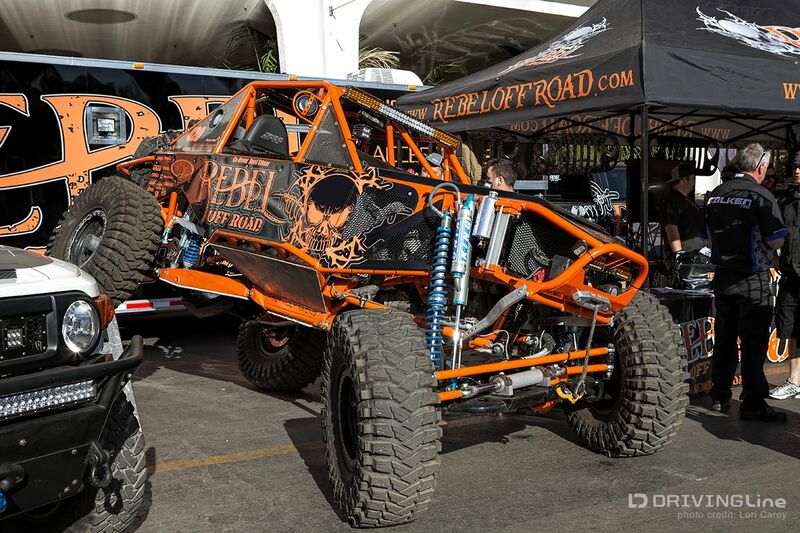 RESQ1 is a functional mobile off-road shop that is fully trail capable and includes air supply, welding, cutting and wrenching tools along with the ability to dismount, repair and remount tires. LS Engine swaps were mentioned as a big trend by several of the shops at the Expo. 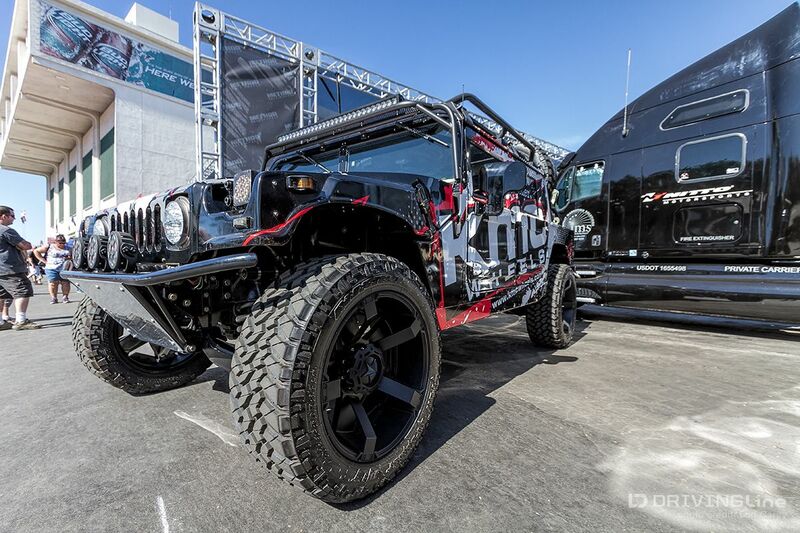 As any 2007-2011 JK Wrangler owner knows, the stock 3.8L V6 “minivan engine” just isn’t enough power on a rig that is lifted and wearing big tires and heavy bumpers. Hemi swaps or superchargers had been the traditional engine alternative, but LS swaps are starting to become popular. An LS engine is a Chevy V8 - in this use specifically, the Chevy V8 Vortec truck engine is the popular choice. These engines are fairly abundant, so it’s not too difficult to pick up a gently-used one - they are light, long lasting, comparable in MPGs, and there is strong aftermarket support for performance parts. 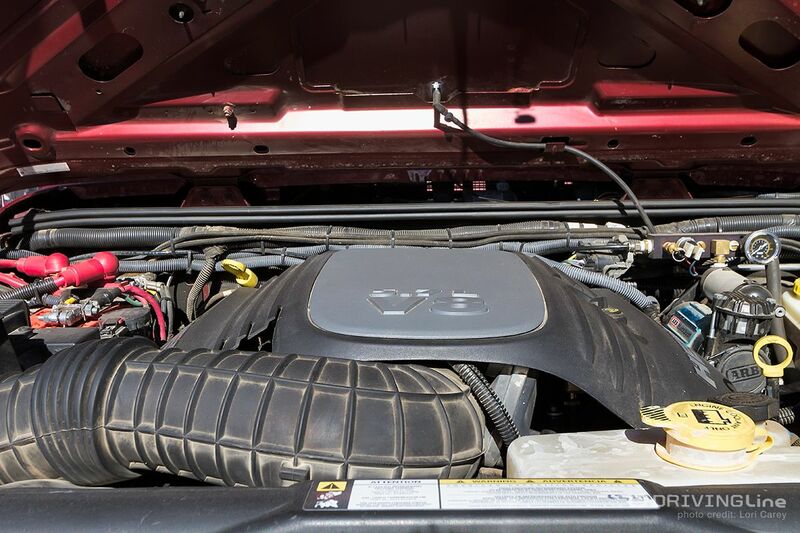 A 5.3LS engine swap typically allows one to utilize the stock alternator, power steering pump, compressor, radiator and drive shafts, helping to keep costs down. The below LS-JK was seen at the Curry Enterprises booth. 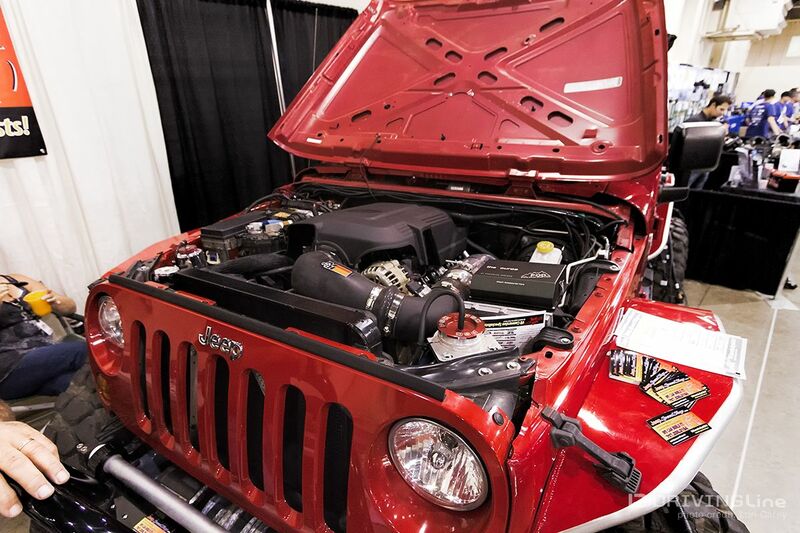 Jeep Speed Shop specializes in LS engine swaps and was showing off this LS-JK. LED lights have been the rage for a while and I don’t think there was an offroad rig at the show not sporting a full complement of LED lights, like this one in the Rebel Offroad booth... Or this rig from Wheel Pros KMC Wheels showing off their new KMC XD Series Rockstar II wheels sporting Nitto Trail Grappler tires. 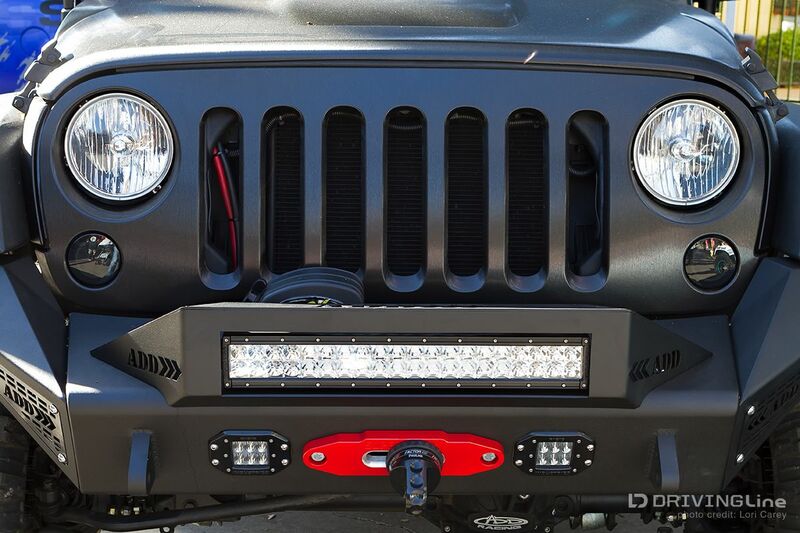 Aftermarket bumper manufacturers are now making their bumpers to specifically accommodate LED lights, such as this new modular Stealth Fighter bumper with sidepods from Addictive Desert Designs featuring an LED hoop and flush mount holes in the center bumper. 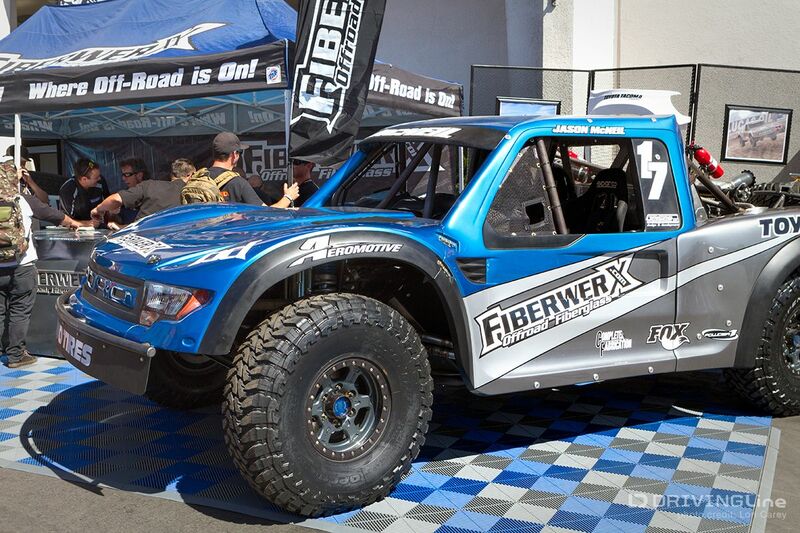 Lights shown are from Rigid Industries. Sometimes it’s the little things that make a difference. Although Rotopack (rotational molded polyurethane resin) cans for carrying gas and water aren't new, the small Daystar Cam Cans I noticed on several vehicles caught my eye. They are the perfect size for carrying other fluids - like transmission fluid, coolant or oil. Anyone who owns a Jeep knows that space inside the vehicle is a premium (especially in a 2DR), so being able to carry these fluids outside the jeep might mean the difference between having them along or left at home. 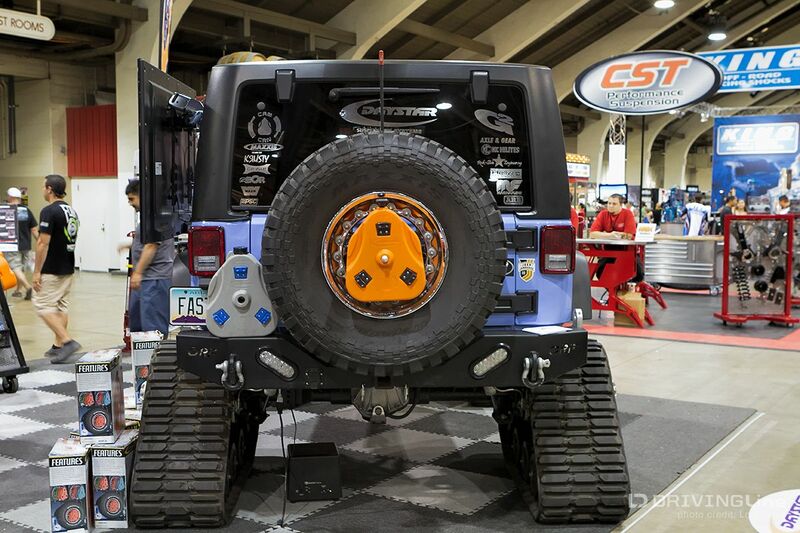 Designed to mount on the spare tire, but I also saw several vehicles with them mounted in other locations using the L-bracket specifically designed for UTVs. Each Cam Can holds 2 gallons and the lockable shaft can hold two cans. They come in gray/blue for potable water, green for non-fuel liquids, and the orange is a trail pack for items like a recovery strap and small tools.